The second annual Aces Against Aneurysms tennis tournament netted $12,000 for the Brain Aneurysm Foundation. The tournament’s organizing committee shared the news today at the Pelican Athletic Club. A check was presented today in the memory of Robert Simon. On March 23, 2011, Simon died of a ruptured brain aneurysm. 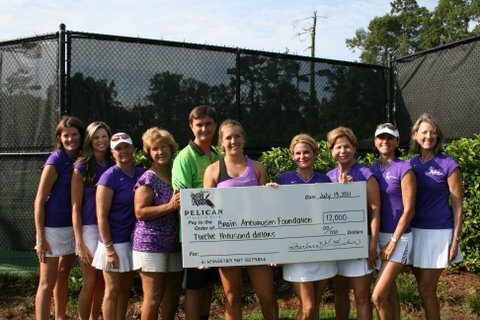 To honor his memory, Pelican Athletic Club Charity Foundation donated the tournament’s proceeds to the Brain Aneurysm Foundation. The Aces Against Aneurysms organization helps to raise awareness in the Gulf South region about the potentially deadly condition. Rebecca Winchell, a survivor of a ruptured brain aneurysm, established the tournament in 2010 as well as a website (www.brainsupportnola.com) and support group in the New Orleans area. Robert Simon was a loving husband, father of two children and an avid tennis player. The tournament is now dedicating its funds in his memory so that research and efforts to reduce the number of deadly aneurysms may continue.